Typhoon Hagupit (Bagyong Ruby) continues to weaken as it moves closer to the island of Samar. The center of Hagupit was last located approximately 180km northeast of Tacloban City, Leyte or about 200km east southeast of Catarman, Northern Samar. Maximum sustained winds are down to 205kph with gusts of up to 250kph. Typhoon Hagupit is moving westward at 15kph. Signal #3: Catanduanes, Albay including Burias Island, Sorsogon, Masbate, Ticao Island, Northern Samar, Eastern Samar, Samar, and Biliran. Signal #2: Camarines Sur, Romblon, Aklan, Capiz, Northern Cebu including Cebu City, Bantayan Island, Leyte and Southern Leyte. Signal #1: Southern Quezon, Camarines Norte, Batangas, Marinduque, Oriental Mindoro, Occidental Mindoro, Antique, Iloilo, Guimaras, Northern Negros, Rest of Cebu, Bohol, Surigao del Norte including Siargao Island and Dinagat Province. 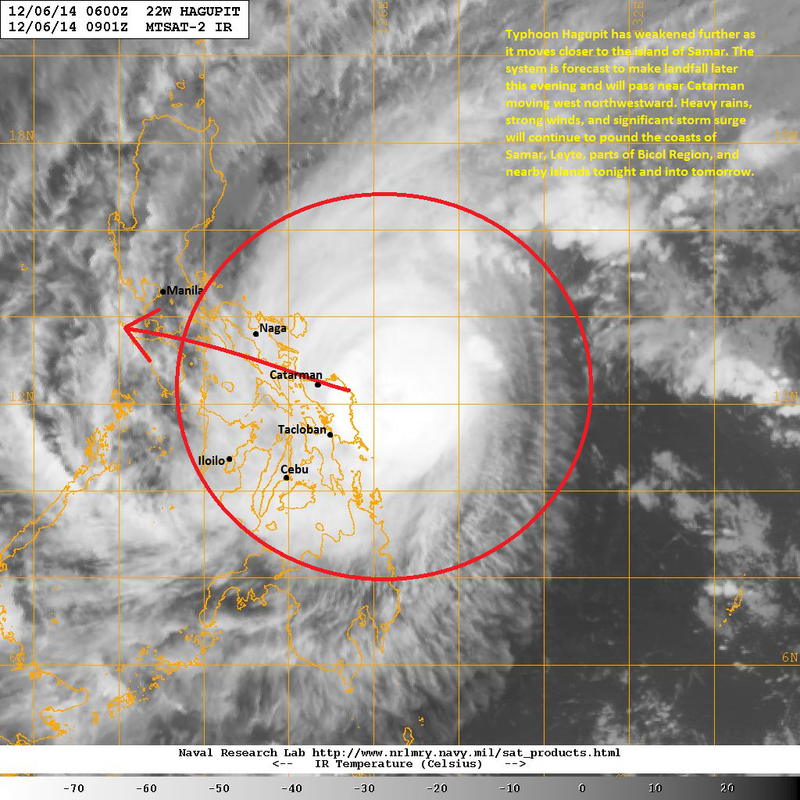 Latest satellite image shows the central dense overcast of Typhoon Hagupit is moving closer to the island of Samar. 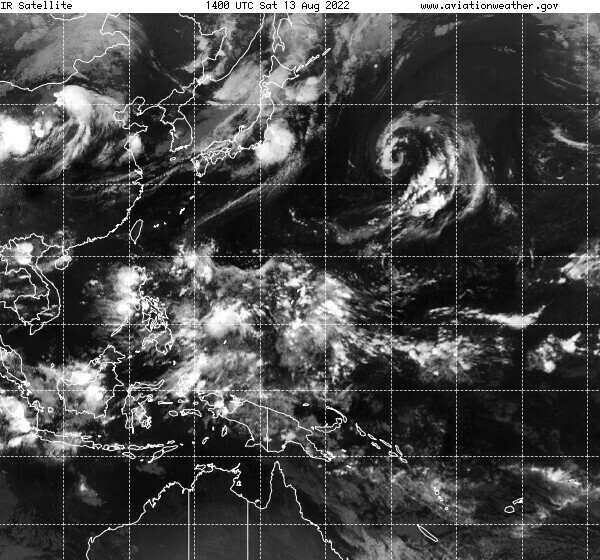 The system's eye has become cloud filled as it encounters increasing wind shear and dry air from the north. Nevertheless, Typhoon Hagupit remains a powerful and highly dangerous cyclone. Strong winds, heavy rains, and high waves are now impacting much of Samar, parts of Leyte, and the Bicol Region area. Conditions in the region will continue to worsen as we move into the evening hours. The center of Hagupit is forecast to make landfall somewhere in Northern Samar (possibly near the town of Gamay) before midnight. It will then move very near Catarman and then into the province of Sorsogon. It will continue moving generally west northwestward, weakening along the way but still bringing dangerously stormy conditions. By tomorrow morning, Hagupit will be moving near Ticao, Masbate, Burias Islands, Romblon, Marinduque, and parts of Quezon. Heavy rains will also spread and could affect the rest of Visayas to the south, and parts of Southern Luzon to the north. Please pay close attention to the news for the latest warnings from your local officials! We'll have another update later tonight. Stay safe!